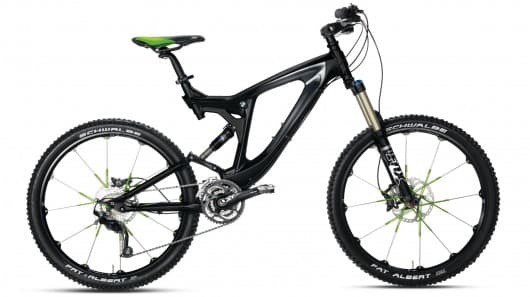 The world renowned motorcycle maker BMW has launched the latest range of bikes for the year 2012 called Mountainbike Enduro 2012. The latest range of bikes is equipped with Crank Brothers wheelset to offer better stiffness and downhill performance. Fox 32 O/B trail fork offers a travel of 140 mm (5.5 in) . The improved frame retains the weight of about 14.8 Kg, just like the 2011 model. Of course the BMW bikes are not for everyone (unless you're *RICH*). But it'd be nice if our mechie friends can talk a bit about the engineering that's gone into these bikes  . Would be interesting information for sure. Do you know that BMW is the official partner for the 2012 Summer Olympics going to be held in London. The company will be providing 3000 cars for transporting games official, event managers and judges and also for pulling cars out of water. The models being used would be BMW 5 series, BMW MINI Countryman and BMW 1 Series etc. The bikes would be BMW R1200 RT Motorcycle and the bicycles to be used are BMW Streetcruiser Bicycles.Here those bicycles will be use which you have mentioned. And one more news Skoda is also going to launch a new version of Skoda Fabia i.e. Skoda Fabia Scoute. The Skoda Fabia Scout differentiates itself from the standard hatchback mainly through its substantial scratch resistant protection at the front (bumper with spoiler), rear (bumper with diffuser) and protective cladding on the sides making the vehicle’s exterior body rugged enough to withstand any damage from loose gravel or rocks when pacing down poorly paved roads. But what about this bike ? The bike which is posted here will be used in London Olympics.That's I want to say.